Are you thinking about taking an Advanced Placement class next school year? Please look through this catalog to learn more about the classes that are available to you. All students that take an AP course are required to sign and complete the Advanced Placement Course Expectations document which can be accessed by clicking on the link below. All students must submit the form by the due date on February 1, 2018; Students WILL NOT be enrolled in AP courses without this signed document from both parent/guardian and student. Summer reading assignments for summer 2018 may be accessed via the links below for each AP course. Students are expected to complete the pre-course/summer requirements specific to that course. Assignments are due the first day of class on August 6, 2018. Please email the teacher of your course if you have any questions. 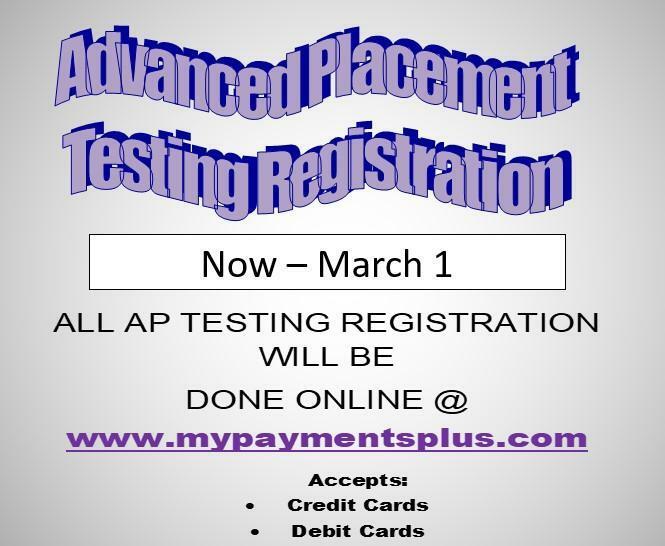 All students that take an AP course are required to take the AP exam for that course in May. Students will take practice exams in class throughout the year. Please see the attached letter for additional information on how to register for AP exams. Payments may be made through www.MyPaymentsPlus.com. Registration Deadline for Spring 2018 - March 1st. • How can AP help me in college? • What are the top reasons for taking AP courses? • What is an AP course like? • Which is more important--advanced classes or a high GPA? • What is the difference between CP, HONORS, GIFTED, and AP courses? • Where can I find additional information about College Board? • Is it possible to take an AP course without a teacher recommendation? • Is it a requirement to take an AP exam for each course? • Are senior students exempt from taking final exams during the second semester? Advanced Placement classes are based on college-level courses. They teach higher level thinking skills and allow for the students to experience the atmosphere and the expectations of a college course. AP courses can also provide college credit, increase the chances of success in college, and help save money on college. For additional AP information go to https://apstudent.collegeboard.org/home or contact your child's AP teacher. According to research conducted by the U.S. Department of Education, the College Board, and Educational Testing Service, there is a strong correlation between participation in AP courses and student achievement, college readiness, and college completion. Researchers at the University of Texas concluded that students who successfully participated in one or more AP exams significantly outperformed their non-AP peers (Hargrove, Godin, and Dodd 2008). • AP classes can save thousands of money in college costs. • AP students may be granted sophomore standing or given credit in college courses. • AP students improve their chances of being accepted by the college of their choice. • AP grades are weighted in Gwinnett County by 10 points. • Because students work at an advanced level and acquire higher reasoning skills, students normally score about 100 points higher on College Board tests than their peers. • AP students outperform their non-AP peers in college. What is an AP course like? Visit the link to the AP College Board website to read testimonials from AP teachers and students. https://apstudent.collegeboard.org/exploreap/the-ap-experience/ap-teachers. What is more important--advanced classes or a high GPA? Colleges want to see both. They want to see students excelling in higher level courses. Research shows that if you can be successful in an AP course then you are usually successful in college. What is the difference between CP, HONORS, GIFTED, and AP courses? General academic coursework that prepares students for college and/or post-secondary plans. HONORS & GIFTED Requires doing homework on a consistent basis, active participation in class, and reading and studying outside of class. Honors/Gifted classes have the same course standards. They are both higher level classes than CP. The work load is more. Because of this, colleges are looking for honors and gifted level courses on students’ transcripts. Gifted courses are available to students who meet specific eligibility criteria. You must be tested into the Gifted program. Duluth High School does not recognize Honors as a lower level from Gifted. Advanced Placement Advanced Placement courses are college-level classes. AP course-work is demanding and recommended for students who are mature with strong study skills. AP classes are writing intensive and rigorous. AP exams are administered for a fee (Your first exam is FREE; you will only be responsible for the $10 registration fee. Additional exams will be administered for a fee of $92) at the end of the school year. It is the expectation of Duluth High School that you take the AP exams for the AP courses in which you are registered. Many, but not all, colleges award credit for passing the exams or allow a student to be exempt from certain college courses. It is our hope at Duluth High School that every student consider taking at least one AP course during high school. Where can I learn more about College Board and AP curriculum? Is it possible to take an AP course without a teacher recommendation? • Yes. A student can obtain a "Parent Request for Reconsideration of Placement" (formerly known as waiver) form in the Curriculum Office in the 100 building. • The student must meet with their current teacher to discuss this request. The teacher must sign the form either agreeing with the request or noting they still have reservations regarding the request. • Both the parent and the student must sign the form. • The completed form is submitted to the Curriculum Office and the student will be given an AP Course Expectations document to complete electronically, if applicable. • Once the document is signed and returned, the Curriculum office will send the signed document and a copy of the signed "Parent Request" to the appropriate AP teacher. Is it a requirement to take an AP exam for each course? Are senior students exempt from taking final exams during the second semester? 1.) A senior who had an overall "A" average, 90% or greater without rounding (Honor Graduate status), will be exempt from taking semester examinations for second semester except when an EOC assessment is required. 2.) A senior who has earned an "A" average, 90% or greater, in a specific course may be exempt from taking the second semester examination on a course by course basis. For AP classes, since the 10 points are not added until after the final grade is calculated, seniors must have an "A" average without the 10 points in any AP class in order to exempt.